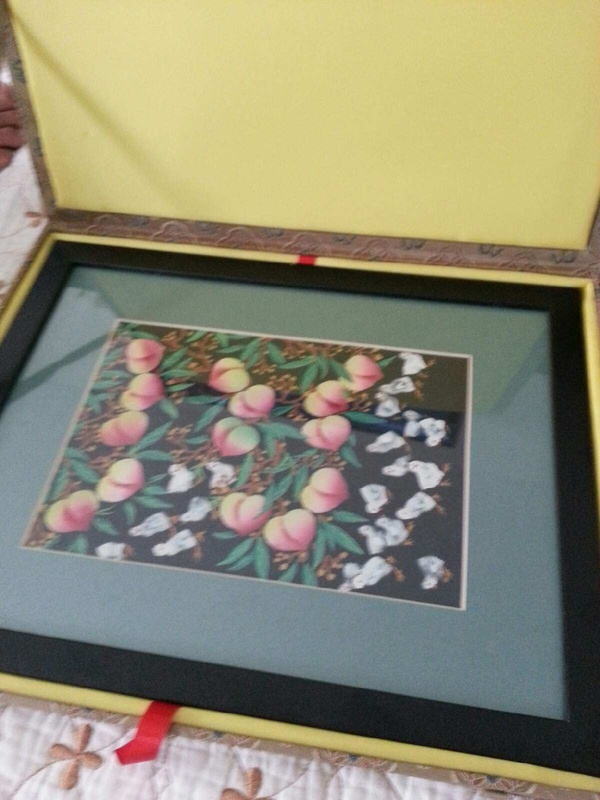 What Huxian Farmer Painting is all about. Published on April 30, 2014 by Shivaji Das Follow me on Twitter here. Fattened chickens delicately balanced in a bicycle, joyous grandmothers cleaning the ears of laughing grandfathers, fish competing with each other to fall on the fisherman’s boat, and stacks of bountiful corn harvests dwarfing mountains: all our good deeds had finally landed us in paradise. We were at the Huxian Farmer’s Painting Exhibition Hall in Huxian, Shaanxi province. To add to our delight, we were not even charged the 5 yuan for the tickets. Our interest in these Huxian paintings was sparked when we saw a certain poster in every restaurant in Xi’an. 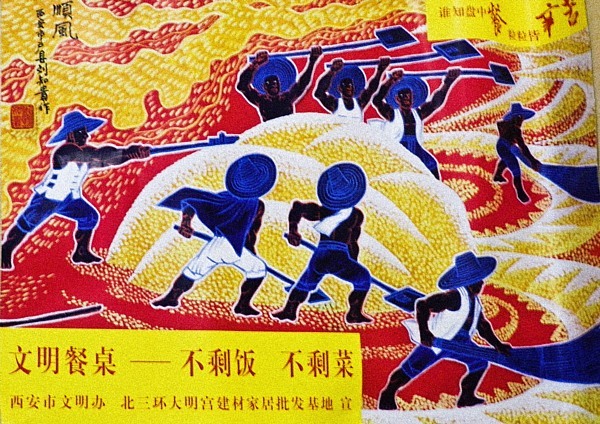 It was a bright red and yellow peasant painting of men harvesting grain in synchronized motion; accompanied by poems and captions asking customers to be civilized and avoid wasting any food. 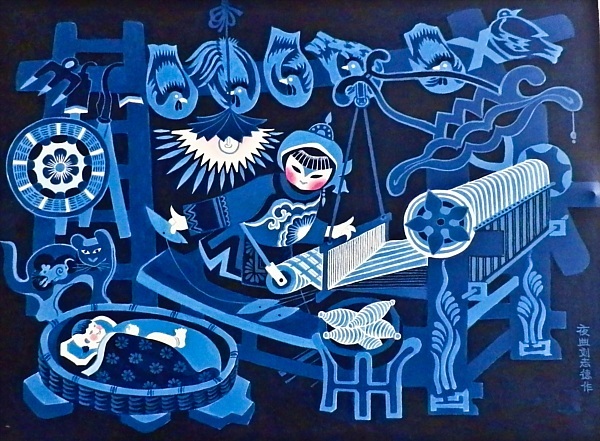 Bright contrasting colors, thick lines, repeating patterns, compositions occupying the whole frame; these are some of the characteristics of these peasant paintings. The farmers paint scenes from the communist rural idyll. Recurrent themes are bountiful harvests, medication of farm animals, villagers collaborating for small community projects, weddings and content families. What is absent is any reference to China’s ancient history. This was a remarkable respite for me; bored and irritated by Modern China’s obsession with anything smelling of antiquity (read the viral spread of Royal style cuisine, antique hunting reality TV, period movies and costume photography). Also absent are any scenes of pre-marital romance, any sign of depravity, and any religious imagery. 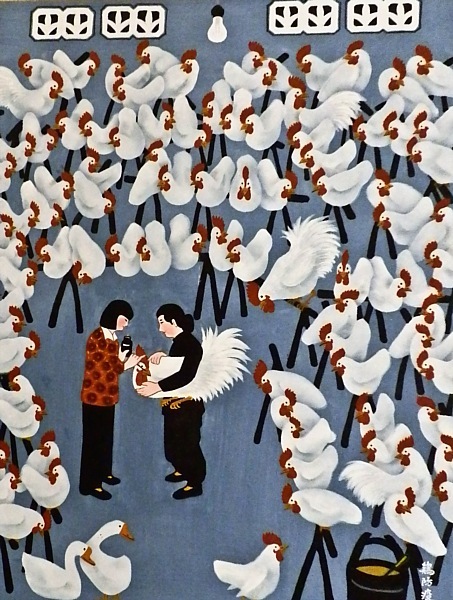 Huxian farmer paintings are among the few distinct schools of peasant paintings that began in China during the communist period; the others being Jinshan, Liuhe and Pizhou. At Huxian, the origins are traced to 1951 when a few farmers had begun painting and were subsequently trained by artists from Xi’an. 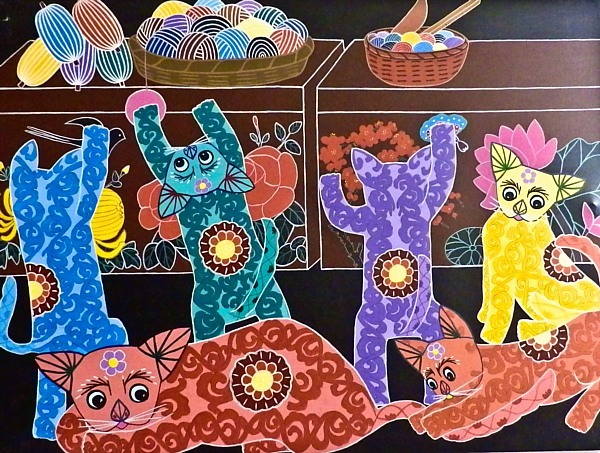 The painters were also influenced by other Shaanxi traditions of paper-cutting and embroidery. The farmers began with watercolors. Subsequently, a few skilled hands began trying acrylic and oil. Some even began experimenting with Western concepts such as Cubism. Some Huxian paintings have been featured on China’s postage stamps. Some have even been featured on stamps of tiny Andorra. Few notable painters such as Liu Fengtao, Fan Zhihua, Liu Zhide, Liu Zhigui, and Wang Wenji gained national and international recognition. Fengtao showed us his workroom while his wife went into another room to watch TV. He then got six thick stacks of paintings and began showing them to us, one by one. He explained to us the scenes in each of these paintings, “This one; the villagers are building a well. This one, they are singing in village opera. I have experienced all this myself.” We had seen exact copies of most of these in Xi’an shops. Once a Huxian painter paints a decent original, other painters, famous or amateur, rush to copy them in bundles. The quality of many of these paintings can make a viewer wonder whether they have been churned out by a factory staffed with primary grade students. 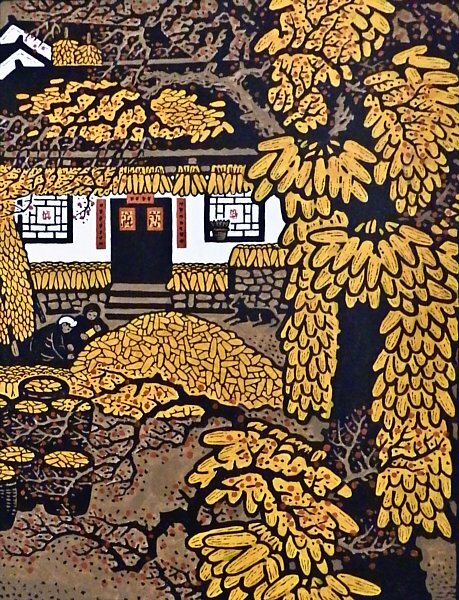 “What makes a good Huxian painting?” we ask Fengtao. He evades our question. We headed to the village of Donghan where most of the painters were living. The gates to the village had one of those typical English plaques in Chinese, “Peasant Painting Scenic Area.” It was hardly a village. It was arranged in a neat grid pattern with paved roads lined with smart bungalows whose courtyards looked uniform with trees loaded with peaches. Columns of bright orange corn hung from one or two of these trees, but at much lesser abundance than what was shown in the paintings. There was hardly anyone in the streets. The village could have fit in easily in any of the Silicon Valley neighborhoods. 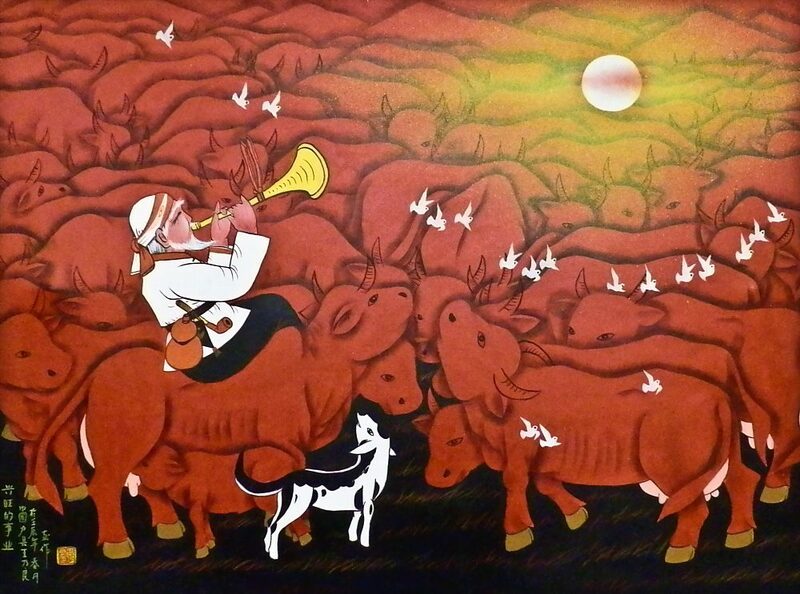 The fattened pigs, circling torrents of fish, and bare-chested flute players serenading cows had disappeared somewhere. 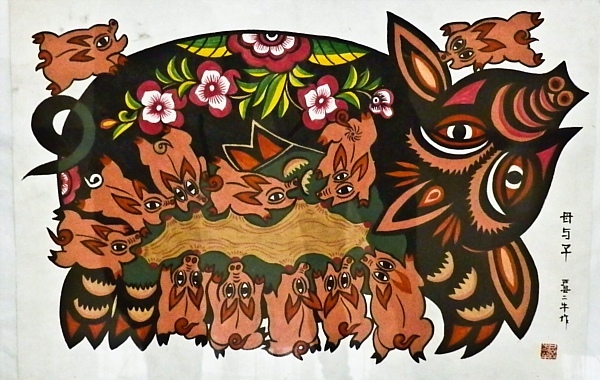 Peasant paintings decorated the village walls and the playgrounds. Government buildings had big portraits of Hu Jintao and Xi Jinping in their courtyards. On their walls, there were several public information paintings advising villagers on different measures to protect their wealth: Don’t keep money under the bed, don’t put money in washing machine; don’t forget your money in the cupboard; a rather long list of possibilities. Back at Donghan, we noticed the signposts indicating addresses of famous painters. But we were wary of entering them lest we be obliged to buy their work again. Huxian saying: Huxian paintings become more and more expensive the further you go from the shops and the closer you get to the painters. But from one such artist’s studio, a lot of noise was emanating. We peeked in and gosh, there were thirty American kids inside. They were all trying to paint Huxian style. They had been bussed in by a tour company. The mystery behind who all were the farmers churning out this enormous quantity of Huxian paintings was finally solved. There was a Farmer Painting Exhibition Hall in the centre of the village. A rather bored attendant was passing time there. We had seen all the paintings before; but these seemed of better quality. There were too many of these paintings so even in the exhibition hall, many had been stacked up on the floor and on tables. I pondered on a metaphysical question: In their quest to depict rural bounty; there had emerged a bounty of Huxian paintings themselves. An excess that was spilling over everywhere: at painter’s houses, in exhibition halls, in tacky tourist shops. Out of the village gates, and back into the village belt, we were looking for a vehicle to go back. At the main road, a bunch of men and women ran towards us. They were looking at me excitedly as if I had just landed in from Mars. When I made a gesture towards them, they got ecstatic. They kept discussing me among themselves. One man dared to ask, “Are you from Xinjiang?” They arranged for an open top farm van to take us to Xi’an. Once the farmer dropped us back at Huxian, he rushed back, “We are not allowed to bring passengers here.” Many critics have evaluated Huxian farmer paintings as a distorted form of reality; trying to project in faux glorious splendor what must have been an otherwise tough life in the village. But in that last hour in Donghan, among all these strangers gawking at me, I formed my own theory about these farmer paintings. They were foremost about expressing this loud simplicity of these villagers. 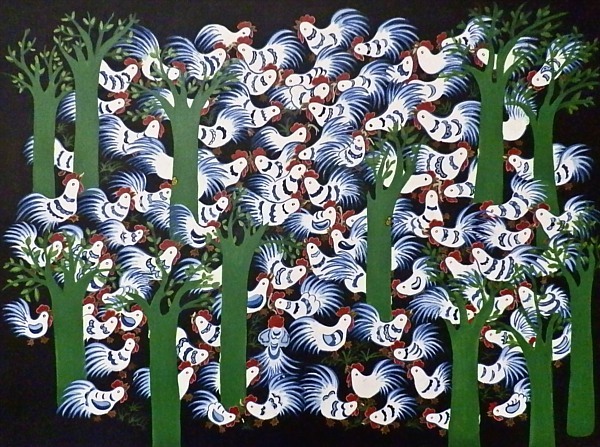 A big fat chicken, everyone in the family alive and together, a lush stream in this arid land, a life without conflicts, and denial of an uncertain future; it must have been impossible to restrain a farmer from painting more and more and more. Until, economic prosperity became a reality for China; perhaps at the cost of this loud simplicity.